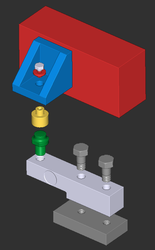 Arrangement for mounting a shear beam load cell. This is a simple arrangement with a load button and socket and provides a pivoting contact with allowance for a small amount of lateral movement. Lateral forces may still be transmitted through friction, a lip is present on the socket to prevent the load sliding off the button. The bolt fixing the cup in place is selected to match the bracket and particular cup. Select the appropriate related product to view or order the pertinent components.